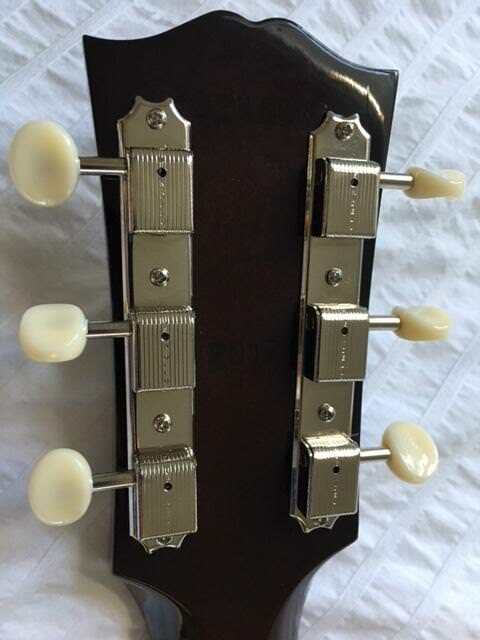 After some deliberation I pulled the trigger and ordered some Kluson 3-on-a plate white button tuners and conversion bushings and will be swapping out the Rotomatics on my J45 Standard. - Sanding off the "raccoon eyes" left by the Rotomatic washers on the headstock. 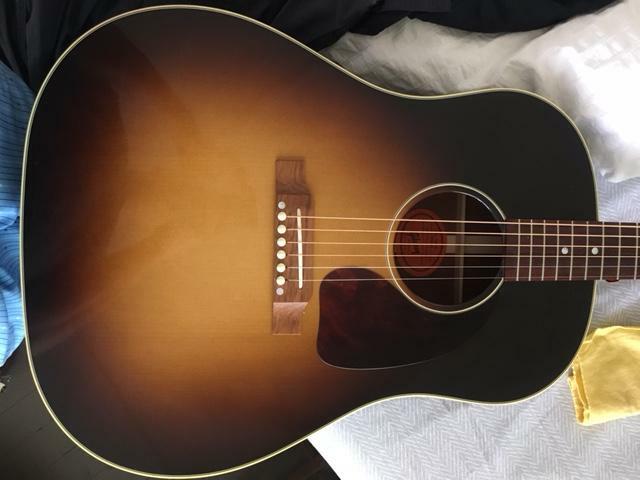 Yes, this is basically a case of diminishing returns, and I know this sounds like a lot of work to put into a regular old J45 Standard, and others will most likely be thinking, why not just sell the Standard and get a used True Vintage or Vintage model?! Well, I've been down that road already. This is my third J45 Standard, and have also had a TV and V model, and this Standard I have now seems to be the best of the bunch (I know it sounds nuts, but the particular Vintage model I received was pretty bad, and was a major disappointment), so I figured I'll just turn the one I have aesthetically into what I want, and while I'm at it, drop in a better sounding pickup. Yes, this is basically a case of diminishing returns, and I know this sounds like a lot of work to put into a regular old J45 Standard. I don't know, sounds freakin' awesome to me. Nice tuner's on a nice guitar, you're just going to like it all that much more. Congrats! 1) I thought you sold this guitar? I sold it then bought it back. This poly-modification deserves a couple of photos. Interesting to hear 'bout your 45-experiences. And yes, the Standards can be very very good. How do you feel about the MOP-logo ? Not that 45ish, is it. .
Oh, I could care less about the logo and how it wont be "accurate" looking with the white button tuners, etc. Only the true sticklers and snobs will turn their nose up at it or possibly make backhanded comments, etc. I'm not trying to turn this guitar into something it's not, more like attempting to personalize it aesthetically into something I enjoy looking at and to make it sound better when plugged in. The rubber pickguard bugs me more than the headstock logo. I'll for sure post pictures when it's all said and done. 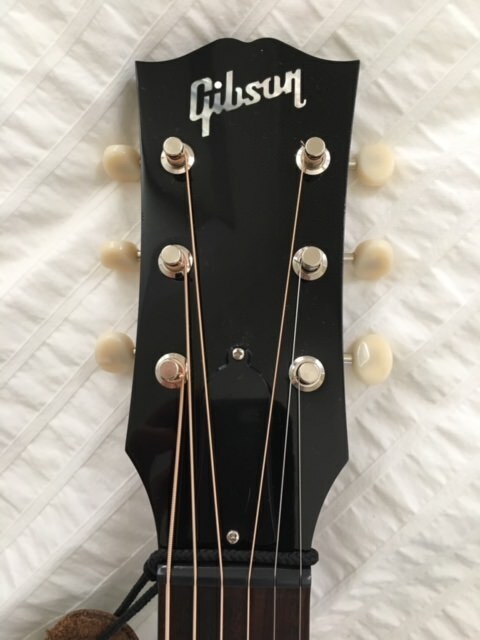 Just for reference, he's someone else's J45 Standard with the white button tuners and "modern" headstock logo in sort of a gold foil. Looks fine to me, and dont really think it will look horrible with the MOP. Good mods. Makes a great guitar nearly perfect. What I'll be doing as soon as a nice J-45 lands in my yard. Please post pix when your mods are done. Whatever makes you happy. And if you found your combo, things couldn't be better. I personally think a J-45 likes faded white ovals plus a golden logo and have considered exchanging the Grovers on my 45 Std. (the head-stock steel-mill). Would do if it wasn't for the vintage ancestors in the herd. They cover all the classic virtues and goin' from the splendid 2010 black nut Std. to the oldies makes me appreciate that even more. 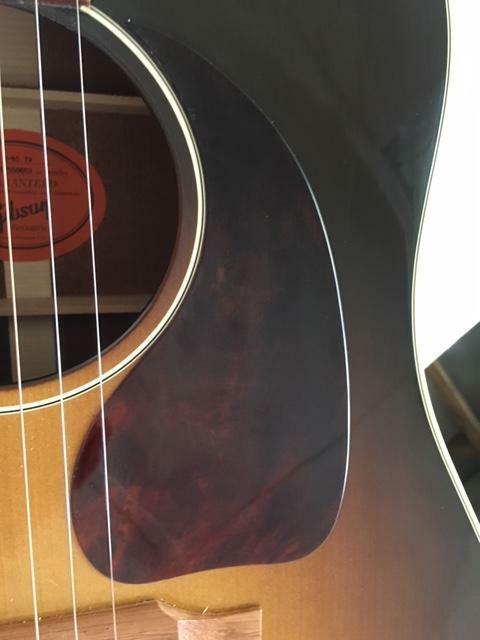 Have fun with guitar, , , ouh, and don't forget the pics. .
You're in the wrong room if you think anyone 'round here will give you grief for going through a bit of effort to make a J-45 Standard into something just as you'd like it. Good luck with the mods- 'looking forward to hearing and/or seeing how it turns out. [Edit] congrats on your good luck in getting it back- sometimes there are second chances. I agree, stark white buttons dont really look right, even on a brand new guitar. The Klusons I got look closer to an aged/cream color. Will pair better with the off-white binding and aged bridge pins I have coming. Hey, if you are enjoying the effort, that's what it's all about. I do not think you will hear anyone object to your making a guitar more aesthetically pleasing to your eye. Other than the pickup installation it is all pretty routine stuff. 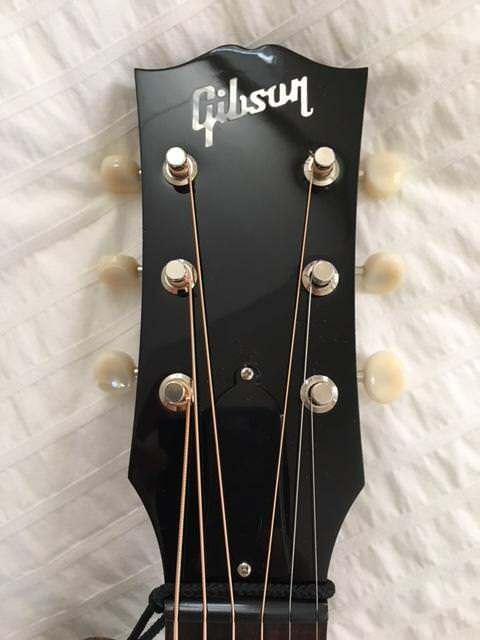 enjoy yer git, I do wonder about the saddle and nut, if it sounds and plays great why risk a new sound and feel ? The guitar actually has a Bob Colosi bone saddle currently and sounds great, but I'm removing the current UST and have the action where I like it, or may even consider raising the action on the high side JUST as little. 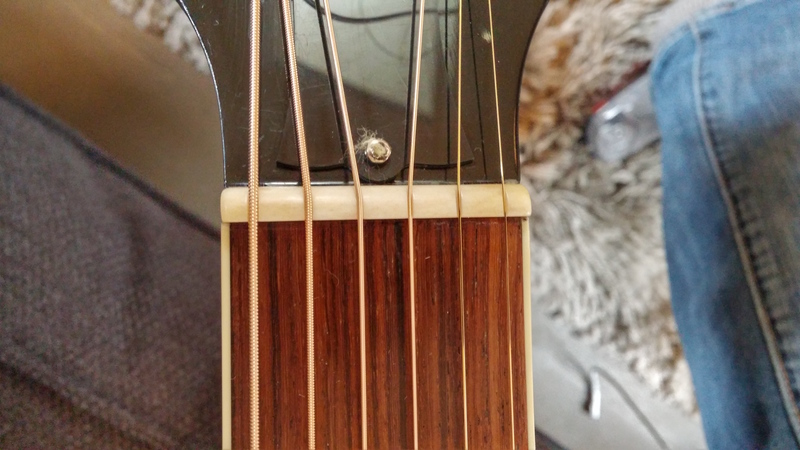 Removing the UST will lower the action even more, and I'd rather just replace the saddle than shim the existing one. As far as the nut, a couple of the nut slots are cut a bit low on the stock Tusq saddle. No desire to shim a Tusq nut, and I've Neve heard of anyone filling a Tusq nut slot and re-cutting it, so I'll just have a new one made of bone and do it right instead of replacing it with a new one made of Tusq. No sense in being cheap, shimming nuts and saddles, etc., just to save a couple bucks. If you[re going to do it, do it the right way. I've made nuts and saddles for quite a few of my acoustic sin the past, including the slotted saddle for my AJ and have also made a pickguard for an older J45TV. 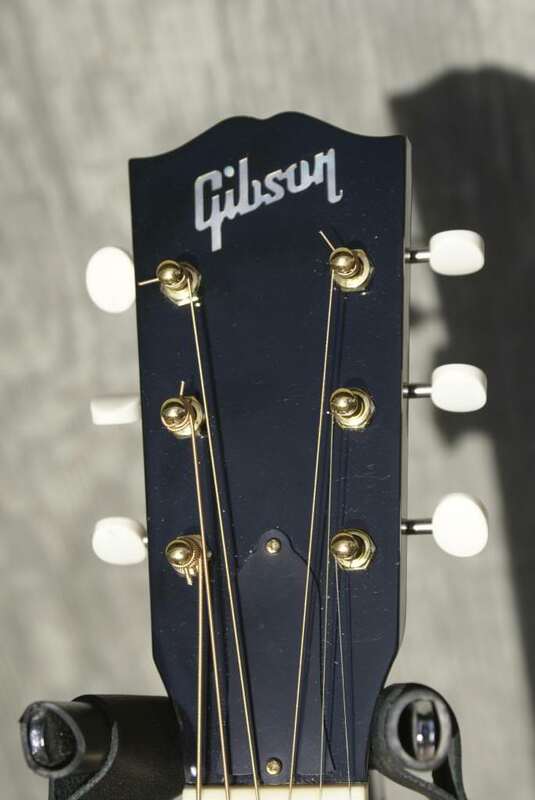 I'm also capable of installing the tuners, reaming the existing holes for the conversion bushings, etc., but a little hesitant to do the finishing work on the headstock to get rid of the raccoon eyes. I also dont want to deal with installing a K&K, so I'm taking the guitar to a very reputable shop that AI've had work on a few of my other guitars that does amazing work. Currently, I also don't have the time or desire to do any of this stuff myself. I'd rather spend the free time I have playing and doing other things. You’re free to do what you want but a man who does work like the above will have no bother with the knk! It's all a matter of personal preferences - do what you like & enjoy. Tuners are interesting. I actually prefer the feel of standard Grovers, and find them much easier to dial in compared to small button Klusons. A while back, I posted about my dislike of Mini-Grovers, and eventually discovered that, again, it's actually the smaller buttons I don't like. Then figured out that large Grover buttons, as well as many Hipshot buttons, will fit given the proper screw length. Finally settled on Gibson-style pearl tulips. Others in the herd came with white oval Klusons, and they'll remain. 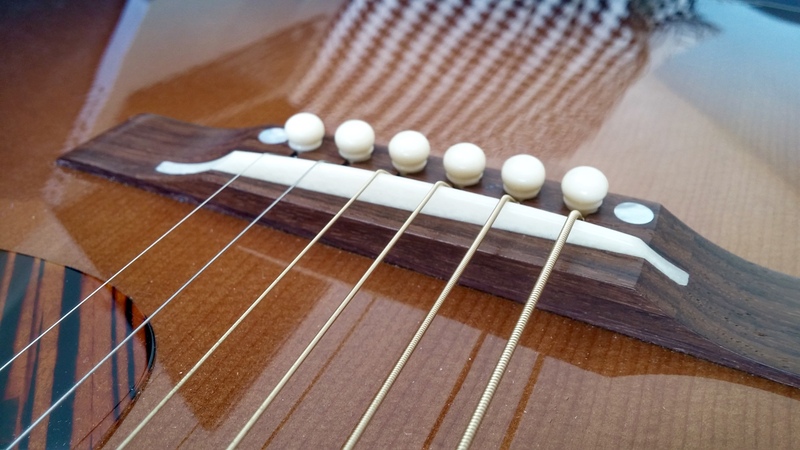 But if a guitar comes with Grovers, I'm a happy camper & will stick with them - reserving the right to swap out buttons! Next will be replacing the thick, rubberized stock pickguard that is lifting along all edges, get the new nut made, remove the UST and install a K&K and set her up!